It is just a matter of time before major multinationals here will see themselves challenged in the courts of the land, by their shareholders, on why they continue to use the services of PricewaterhouseCoopers as their auditors. PricewaterhouseCoopers's clients will see themselves taken to task for retaining your firm as Auditors in Asia, London and New York. Is this not worrying to the Global Leaders of PwC such as yourself? Mr Paul Boorman, Malaysia is not the US or Europe, but in a globalised world, the repercussions from your silence, and that of PricewaterhouseCoopers in general, can be just as damaging. 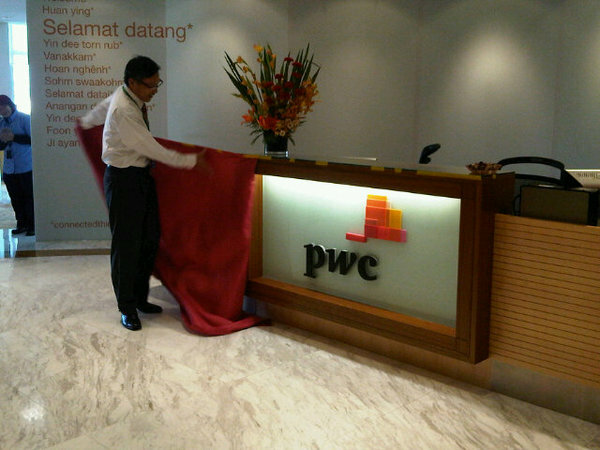 Chin Kwai Fatt at the launch of the New Logo for PwC. But what does a new logo matter when allegations of fraud and corrupt practices are left unanswered? Even the Malaysian mainstream media, which has been just as quiet as you have are, has broken it's silence on the questions raised here. Saturday January 22, 2011, The Star, Malaysia. REMEMBER a blog called Sime Darby Watch (SDW)? It has been completely wiped out when the mysterious blogger he never revealed his identity on the blog abruptly called it quits in April 2009. It's therefore hard to pinpoint when it was created, but early 2008 seems to be a safe bet. One news report puts it as March 2008. That was not long after the completion of the mega-merger that saw Sime Darby Bhd, Kumpulan Guthrie Bhd and Golden Hope Plantations Bhd becoming a single entity we now know as Sime Darby Bhd. It was apparent that the blogger had not come from the old Sime Darby. In fact, he explained that the blog was “for employees of the now-defunct Kumpulan Guthrie and Golden Hope to voice their views and concerns”. The blogger clearly had access to a lot that was going on at the new Sime Darby and was decidedly critical of its management, which was dominated by executives from the old Sime Darby. He often brought to light major developments and issues at the company that had not been publicly available. SDW was easily the most well-known among the blogs that targeted local businesses. Sime Darby was (and still is) one of Malaysia's biggest companies, and the merger had enlarged it further although not everyone thought the exercise was a good idea. And as a government-linked company, there was (and still is) a political dimension to many of its actions and decisions. These factors guaranteed a ready audience for dirt on Sime Darby. The blogger's ability to consistently expose alleged wrongdoings and his writing skills in lambasting his target, also helped SDW garner a significant following. No other anti-corporation blogs have so far come close to SDW's influence. Most have been short-lived, seldom lasting beyond a handful of entries after the bloggers had run out of things to say or have simply exhausted their motivation to blog. However, another blog has recently surfaced, promising to go on “for months to come to weed out corporate misconducts (sic) as a service to the taxpayers and Malaysians in general”. The blog's title, zarinahtakesapaycut, is a swipe at Securities Commission chairman Tan Sri Zarinah Anwar, but the principal target is actually professional services firm PricewaterhouseCoopers (PwC). The anonymous blogger has been prolific so far. The blog kicked off on Dec 1 last year with four postings. Until yesterday, there have been 34 more. That's an average of one posting every 36 hours! He has also been persistent (and somewhat pesky), compiling an email list to ensure that all those on the list including this columnist and some colleagues are notified whenever the blog has a new entry. The blogger definitely knows a thing or two about grabbing attention. The headlines for the blog entries are usually cleverly crafted and compelling. The blogger has been creative and resourceful in generating angles and themes that suggest that the blog is constantly introducing fresh information and highlighting new players and developments. For example, a Dec 31 entry cited a May 2009 article by this columnist to back up the blog's claims about PwC. The truth is, zarinahtakesapaycut is a relentless attempt to discredit PwC by harping on the same few issues. The bias is obvious. Only the hopelessly clueless will think that the blogger is being objective. Even so, we can't dismiss the blog with the wave of a hand, partly because the blogger is insistent in bombarding readers with details. This is not the place to dwell on how much of the blog is factual. The point here is that the blogosphere has become part albeit a small one for now of the corporate landscape. However, we have yet to properly understand how we treat the information we get from the blogs. The idea of regulating blogs is an incendiary matter and we may not even have to go there but there ought to be more discussion and engagement within the business community about this subject. How can we not be ambivalent about these anonymous bloggers who attack listed companies, Big Four firms and business regulators? On one hand, we are thrilled by the pugnacious muckraking and the whiff of scandal, and we cheer the notion of the lone guy, armed with a PC and Internet connection, going up against the deep-pocketed, soulless corporation? Yet, can we really afford to ignore the questions about the bloggers' motives and integrity, and the veracity of the information they put up in cyberspace? bloggers are indeed accurate and have revealed stuff that the companies had intended to hide, our scepticism may well work against us. And what if the bloggers are way off the mark, or worse, are deliberately spreading lies? In such cases, sometimes, no amount of salt can undo the damage suffered by the targets. And when the businesses suffer, their stakeholders (such as the minority shareholders) feel the pain as well. Yes, legal action is an option, and yes, the mainstream media isn't perfect either. We know this, but what we need to learn next is how to effectively deal with irresponsible blogging. In business, as in politics, one of the worst things that can happen to us is when our ability to choose what to believe in, is weakened by bad information. ● Deputy executive editor Errol Oh doesn't have a blog. So tell us Mr Boorman, and tell the world that this blog is way of its mark. Tell the world that PwC takes allegations of corrupt and fraud practices seriously regardless of which part of the globe they arise from. Tell the world that the question of how much revenue that particular region or nation contributes to the coffers of PwC will in no way influence the speed and seriousness of the action that PricewaterhouseCoopers takes to safeguard it's brand name, its reputation and its credibility. Tell us it is so. How can PwC not even issue a simple statement when its Global Code of Conduct has practically been raped? We all know the regulators in the US and European Union brook no nonsense. But how is that the Global Leaders stood by and allowed a Director in PricewaterhouseCoopers in Malaysia to leave the firm and immediately head up the Auditor Oversight Body in Malaysia, when this will show that the independence of the system has been violated under Rule 4012 of the PCAOB, a regulator under whom PwC in Malaysia was already registered, along with many other PwC offices worldwide? Will the regulators in the US and Europe have allowed the appointment of Sham Directors, or the perpetration of fraud shown here, when one company was renamed as another for sale, allowing the real object of the sale to remain hidden to defraud its creditors? Will you be able to remain silent for so long if this had happened in the US or Europe, Mr Boorman? Could PricewaterhouseCoopers get away with using the services of a 'tainted auditor' in the US or Europe, as your firm has done in Malaysia? These allegations will continue to haunt your organisation globally, in the weeks and months to come, until you come out with a statement in reply, and show that PwC takes the sanctity of its own Global Code of Conduct and reputation, seriously. The PwC Code of conduct defines how we should behave and conduct business in a wide range of settings and situations. The Framework for Ethical Decision Making supplements the code and will help us resolve issues. It is the responsibility of each of us to follow the Code of conduct and PwC policies consistently and appropriately and help others to do so. When non-compliance with our Code of conduct is reported or otherwise suspected, steps will be taken to investigate and, if appropriate, remedy the situation. We are encouraged to report and express our concerns and must do so fairly, honestly and respectfully. PwC is committed to protecting individuals against retaliation. People in the reporting line are responsible for addressing issues that are brought to their attention. Those who violate the code or PwC policies and procedures will be subject to disciplinary action, up to and including dismissal. Disciplinary measures will also apply to anyone who directs or approves infractions or has knowledge of them and does not promptly move to correct them.